Eliott Gates started his skiing career in Verbier at just 2 years old, and returning to the 4 Vallees each year with his family has only cemented his love for the sport and Valais region. 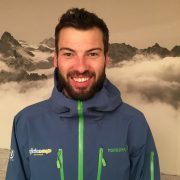 When he finished his studies in 2011, Eliott moved away from the UK to work in Nendaz, eventually becoming the manager for Premier Alpine Centre Ski School in 2016. Eliott currently holds BASI level 3 ISIA and is continuing his development by working towards level 4 (ISTD). He has also recently turned his hand to telemarking so you will often find him free heeling around the slopes. A trained chef, Eliott Gates has a passion for good food and certainly knows the best spots to eat on the mountain! He likes to travel whenever time allows, drawn to the coast to feed his passion for water sports including kitesurfing. Also, a keen football player, Eliott plays as a goalkeeper for the local Printse-Nendaz team. If you think you might like to book ski lessons with Eliott please do get in touch!